Measures approximately: 2.00 x 7.50 x 10.50 in.. Complete with mini versions of our Unit Blocks on Wheels and a Pound-a-Peg, the doll that grows up in this nursery, will have a wonderful childhood! 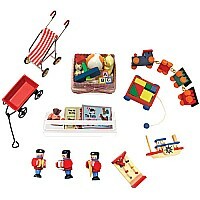 This 11-piece set includes a little red wagon, lots of good books, a toy basket and much more! These are the timeless accessories needed for any 1:12 nursery!